Indian Air Force Chief Arup Raha today said that India needed more than 200 combat aircraft to overcome the emerging challenges keep a military edge over the adversaries. 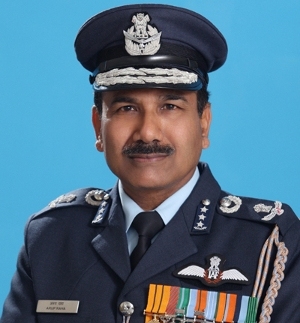 Addressing a press conference three days ahead of his retirement, Air Chief Marshal Raha open up his mind on various issues the IAF was handling, including the dwindling strength of fighter squadrons, which is dipped to 34 now against the sanctioned number of 42 squadrons. The Air Chief indicated that 36 Rafale fighters ordered from France were not enough to match the requirement. “The Rafale is an excellent aircraft and it will prove its worth in any campaign. We have signed only 36…we require more aircraft in the medium-weight category,” Air Chief Marshal Raha said, in his last media interaction as IAF chief. Arup Raha backed former IAF Chief S P Tyagi who is presently in the CBI net in connection with the Agusta Westland case and said that he must be given his due till charges against him are proved. He said, the former air force chief is like an extended family member and the air force should stand by him. Air Chief Marshal Raha asserted that IAF would not have any sympathy against Mr Tyagi once he is found guilty. He said, the air force believes that law of the land should take its own course and once the probe is complete the court verdict should be respected. Mr. Raha described the disappearance of the AN32 flight in July, the Pathankot Air Base terror attack, the One Rank One Pension agitation and the anomalies in the 7th pay commission as setbacks. Raha added that IAF has learnt lessons and are better prepared now. The Air Chief Marshal said, the Air Force has done reasonably well in looking after the sub conventional threats like terrorism. He said, there a need of at least 200 more medium-weight fighter aircrafts in five to ten years. The Air Chief Marshal informed that new tenders will be issued soon for more mid-air refuellers as it is a strategic need. He said, large numbers of radars which are indigenous have been inducted and the Air Force is well on its way to have network centric capabilities. The Air Chief also said that they have upgraded the Advanced Landing Grounds in the northeast. Massive search is on for the missing Indian Air Force, AN-32 aircraft in the Bay of Bengal. While IAF has pressed into service a C130 plane along with two AN32, the Navy has deployed two P8i maritime surveillance and anti-submarine warfare aircraft from Port Blair. Four ships of Eastern Naval Command which were deployed in the Bay of Bengal on different missions, have been diverted to the search area and eight ships of Eastern Fleet, which are on return passage from the South China Sea are also proceeding at best speed to join the search operations. A submarine at sea is also diverted to the area for locating the transmissions from emergency locator beacon onboard the aircraft. Defence Ministry said, more assets are being dispatched shortly. A transport plane of the Indian Air Force, IAF with 29 people on board went missing today. It was flying from Chennai to Port Blair. The AN-32 aircraft took off at 0830 hours from Tambaram in Chennai and the last contact with it was made 16 minutes later. The aircraft can fly for up to four hours without refuelling. Navy PRO DK Sharma said that a massive search operation has been launched by the IAF, Navy and the Coast Guard. Sahyadri, Rajput, Ranvijay, Kamorta, Kirch, Karmuk, Kora, Kuthar, Shakti, Jyoti, Ghariyal and Sukanya have sailed for searching AN-32 from Port Blair and Visakhapatnam. Wing Commander Anupam Banerjee has said that all assets available with Air Force in search operation for IAF aircraft AN-32 would be put in place.